Teachers take attendance, students reply “here.” Some things never change. But what if that process got a tech upgrade? What if AI could tell which students were there based on the way they walked into the classroom? Automating classroom attendance is just way we could use a new artificial intelligence that can identify a person simply by analyzing their footsteps. This unusual system is the work of researchers at Indian Institute of Technology, who published their study on the preprint server arXiv on Monday. 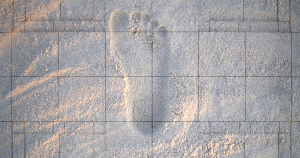 The team needed a lot of data on footsteps to create their system. To collect it, they used a geophone, a device that converts ground movement into electrical signals. They asked eight volunteers to each walk barefooted in a circle with a geophone at the center, coming as close to the device as 1 meter (3.2 feet) and as far as 2.5 meters (8.2 feet) from it. The researchers gathered about an hour of walking data for each individual. That added up to 46,489 footsteps, which they believe is the largest footstep database ever collected. Then they used the data to train an algorithm to differentiate between the steps of different participants by evaluating the time between steps, their length, and their rhythm. In the end, the AI could identify a person with 92 percent accuracy after recording just seven consecutive footsteps. The researchers believe their system could eventually replace other biometric identification systems, such as fingerprint or retina scanners, as it is easily camouflaged and doesn’t require the cooperation of the person it’s analyzing. As for applications beyond the classroom, the researchers note that high-security areas, such as military bases, could use the system to detect anyone who isn’t in an approved footstep database. It could also prove useful in the smart homes of the future; for example, the AI could tell your home’s audio system to start playing a different radio station depending on the family member that walks into a room. Of course, there are still kinks to work out — as it stands, the system can’t identify more than one person at a time, so it’d be useless in crowds. However, the researchers are already working to improve their device, so it might not be long before your footstep is all you need to prove your identity. The post Tread Lightly: This AI Can Identify You by Monitoring Your Footsteps appeared first on Futurism.